First of all, let me wish everyone a happy Lunar New Year! It was quite a day for me, first with my airport adventure and then trying to celebrate the Lunar New Year properly. I’m afraid that this is not going to be a stellar fan account since I still haven’t fully recovered mentally. 😛 But I hope you can bear with me. Before I start with my long winded story, I’d like to thank iGo_Seung for all her help, without which my airport adventure wouldn’t have been possible. 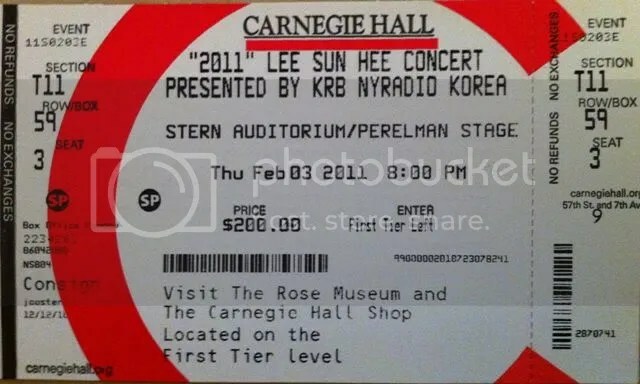 She was actually the one who first broke the news to me that SeungGi was coming to New York as a special guest at Lee Sun Hee’s concert. 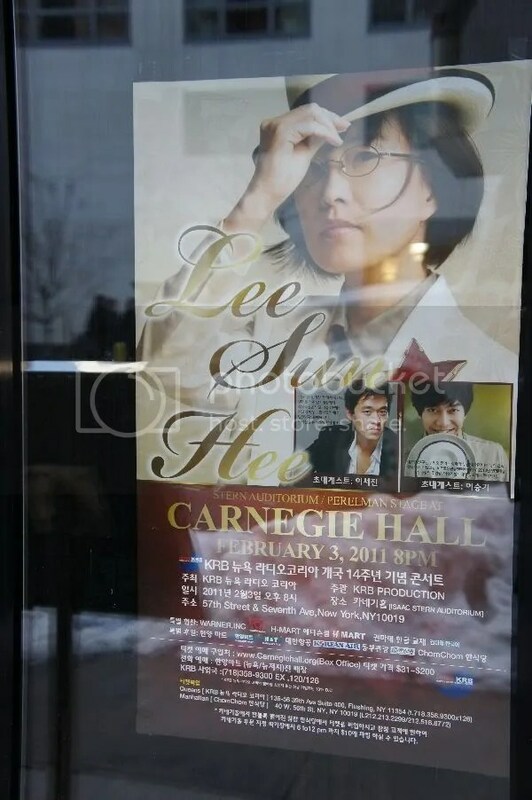 I guess it all started late last year when it was reported that Lee Sun Hee would be holding a concert at Carnegie Hall in the coming February. Because she had been making a lot of public appearances (concert, fan meeting, music show) with SeungGi, I was really hoping that she would ask SeungGi to be a guest at her concert as well, and it even became my new year wish. But I told iGo_Seung that I would consider going to the concert even if SeungGi didn’t come, but only if I could get away from my work. The problem was that my boss liked to get our vacation requests way in advance or she wouldn’t honor them. So it really depended on how early the concert date would be announced. Fortunately, it was early enough, and iGo_Seung actually also found out there was a good chance SeungGi would be coming, so she told me and of course I was super excited. So I sent in my vacation request before the deadline, and also asked her to help reserve the concert ticket. As the date drew near, she asked me if I would be interested in welcoming SeungGi at the airport if she could find out the flight info. Of course I was tempted, but I didn’t know if I could actually go through with it. I mean, I’d never done it before, and I was pretty sure I’d be too old for something crazy like that. 😆 Anyway, I kept debating about it. But iGo_Seung kept me updated. At first the rumor was that SeungGi would arrive on Feb 1st, so when I planned my vacation, I made sure I would arrive in NYC before that. 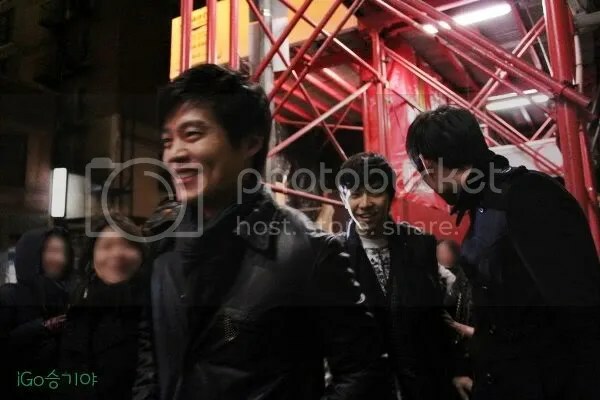 Later on, news articles came out that the Hook entourage would leave Korea on Feb 2nd, and fans somehow found out that they would take the morning flight and arrive in NYC around 10am. Armed with all the information, all I had to do was to show up at the airport. I was still debating even the day before, but I finally convinced myself that it was a once-in-a-lifetime opportunity and I would more likely regret it if I didn’t show up. So I started planning the specifics, and I even rehearsed the scene in my head many times. I was getting so excited the night before, I couldn’t fall asleep. I kept checking on the flight status. There were actually 2 flights from Seoul scheduled to arrive around 10am. One was Asiana Airline, and it was ahead of its schedule. The other one was Korean Air, and it was behind schedule. Their arrival terminals were also different. I double checked with iGo_Seung who said it should be the Korean Air flight. I eventually fell asleep at around 5am and I was supposed to get up at 8am to get everything ready. Of course I overslept, and everything had to be rushed. To make things worse, the area was hit with an ice storm the night before. When I watched the news, it was talking about how bad the traffic situation was, but the subways were supposedly running on time. So I decided to take subways to save some hassles, and hopefully get to the airport on time. For the gift, I bought something before I came to NYC but we’re actually planning to give gifts to SeungGi as a group, so I had to think of something else. I guess the typical thing to buy would be flowers, but I didn’t know if I would get to meet SeungGi for sure, and I didn’t want to keep carrying some flowers back and forth. So I decided to get something less conspicuous. 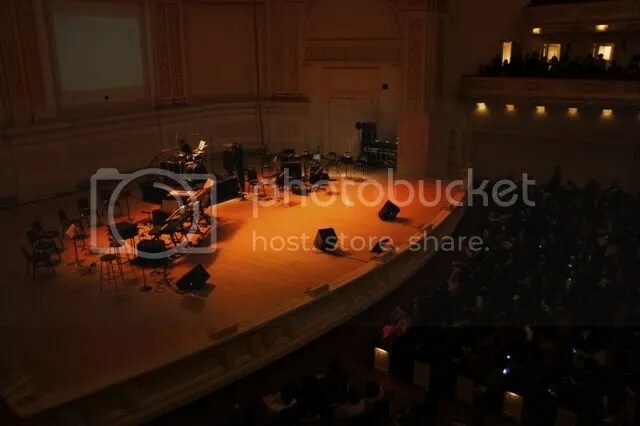 😆 Some fans were planning a small event for the concert, and were going to get some famous cupcakes as a part of it, but the plan was scratched when we found out that Carnegie Hall did not allow outside food/drinks even for staff members. Anyway, that was how I got the idea to buy some cupcakes for SeungGi to snack on. The subway train was running on time, but the AirTrain going to JFK was NOT. I waited forever for it to show up and was really worried that I would miss SeungGi. But fortunately (for me at least), SeungGi’s flight was also delayed. By the time I got to the terminal exit, it seemed that no passengers had come out yet. I looked around to see if there were other fans there. On one side of the exit, there was a group of people who didn’t seem like the typical fans; with quite a few older guys, but a couple of them carrying flowers. So I assumed that they were from the radio station that sponsored and organized the concert. On the side where I was standing, there were a few middle-aged ladies who could be fans, but no one looked as obvious as I did, with a big camera and a lightstick hanging from my neck. 😆 Anyway, I found a good spot with a clear view of the exit door, and started waiting. There WAS a mysterious young lady standing right next to me. At first, I thought she might be a fan, but she didn’t seem interested in making small talks, and I’m actually not good at it either, so I didn’t try to find out. But later, an older couple came up to her and started conversing in Korean. I didn’t understand anything they were saying, but I heard SeungGi’s name! So I butted in, and asked them if they were there to see SeungGi. The older couple gave me a blank look, but the young lady had an interesting reaction. She said, “OMG, I didn’t know.” I thought she meant she didn’t know there would be other fans there, so I asked her if she was a fan, and thought maybe I could find out where she hanged out online. 😛 But she didn’t answer my question, and just kept saying, “Oh, I didn’t know.” At the time, I didn’t think too much of her reaction. But later on, I became more curious. 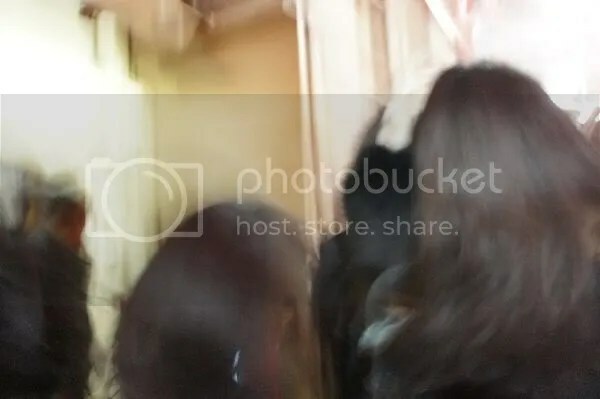 She was obviously there to see SeungGi, but she was not part of the radio station group, and she didn’t seem like a typical fan since she wouldn’t even answer the simple question of whether or not she was a fan. There aren’t many other possibilities, are there? She’s likely someone who knows SeungGi personally. 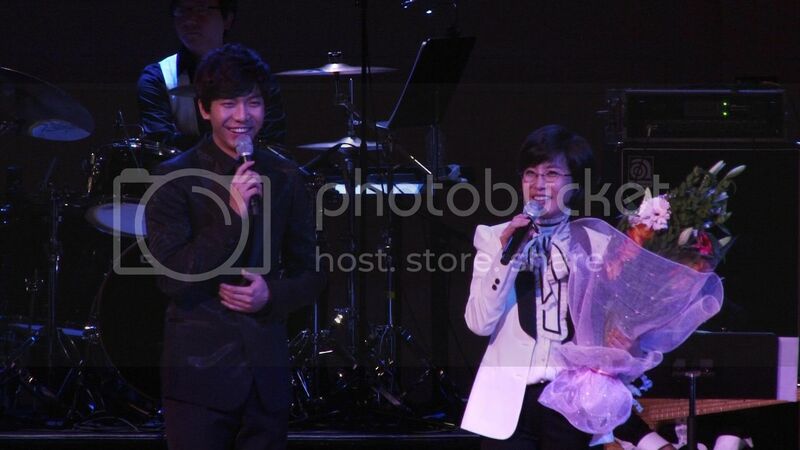 Could it have been his sister, who we know likes to keep her relationship with SeungGi under wraps. Unfortunately, I did not take a good look at her face and I can’t tell you if she looked like SeungGi or not. And she mysteriously disappeared soon after our conversation. So who knows? Back to waiting. People started filing out, but there was no sign of SeungGi. I thought as celebrities, he and Teacher would get some special treatment and be able to come out sooner. But that didn’t seem to be the case. So I started thinking maybe they would wait until the end when the crowd had cleared. So I took my eyes off the exit door and started playing with my camera. As time went on, I was feeling more and more nervous, and my hands were even starting to shake a little bit. So I thought maybe I should change my camera settings to help take decent pictures despite my unsteady hands. When I was playing around, I would still look up frequently to check on the exit. Then I saw SeungGi!!! The reality of finally seeing SeungGi up close eventually dawned on me, and that was when my mind went totally blank from the big shock. I forgot to wave my lightstick, and forgot to call out SeungGi’s name. Fortunately, my hands remembered to click the camera shutter button. But because of all the special settings I was playing around with, the camera was taking a series of shots at once and then processing them into a single photo, which was an unbelievably long process. While the camera was still shuttering away, I noticed someone walking right in front of me, and it was Teacher SunHee! I guess she had come out of the exit door earlier and I wasn’t paying attention. I tried to take her picture, but by the time my camera was ready for the next shot, she already walked past me, and I could only see her back. I was too flustered to be able to maneuver with the camera settings again, so I just kept pressing the shutter button in frustration, hoping that SeungGi would somehow be captured in the photos nice and clear, which obviously did not happen (as you’ve already seen). Since I did not manage to get SeungGi’s attention, I walked around the crowd to the exit area trying to intercept him on his way out. By the time I saw him again, I think he’d already met with the radio station people. He was just standing there with his luggage cart in front of him still, but he was looking either down or sideways. I’d already been told to stop taking pictures, so I was just staring at him. My mind was still blank, and I couldn’t think of anything to say to him. But he was standing SO close to me. The only thing standing between us was the luggage cart!!! I finally remembered the bag of gift I was holding, so I put it on his luggage. He finally looked up. Even though I was still mute (I opened my mouth, but nothing would come out), it was obvious that was a gift for him, so he smiled at me!!!!!! Please don’t ask me how small his face was, how good-looking he was, or how heart-melting his smile was, because I don’t have an answer to those questions. Everything became a big blur. After that, the big group started filing out of the terminal. I followed them closely and got to stare at SeungGi’s back for quite a while. Someone else had taken his luggage cart, and he was only carrying a bag on his right shoulder. When they reached outside, they were looking around for their rides. I was again surprised. There was no limo waiting outside, just a few cars and vans. SeungGi was looking for his ride, and I was still staring at his back. But I think the problem was that I was still holding my camera even though I hadn’t taken any pictures. There had been people saying “No Pictures” in both English and Korean since the beginning. But this Hispanic-looking guy kept pushing me aside, saying he was a police officer and wanted me to go away. Completely rude. I said I wasn’t doing anything, just watching. 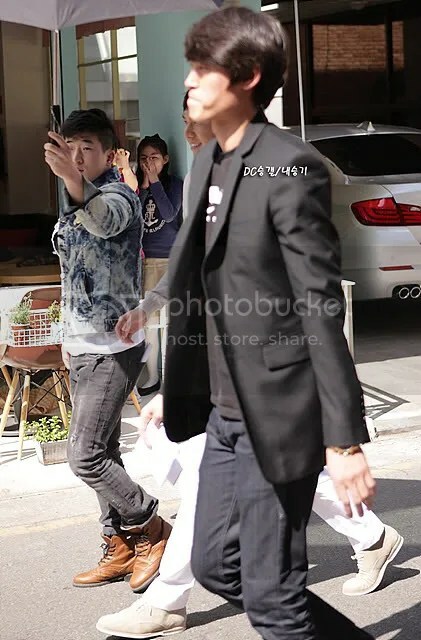 He was like, “You can watch from far away.” By the time he escorted me to a “safe distance”, SeungGi had found his ride, which was a white (or silver?) SUV. He got in, and I think Teacher SunHee was also in the SUV, and they sped off. When I first decided to go to the concert, it didn’t even occur to me how significant the concert date was. The Lunar New Year is definitely the biggest holiday for me, as a Chinese. But living in the US, I don’t often get a chance to celebrate it properly, since it’s not a recognized holiday at school or at work. 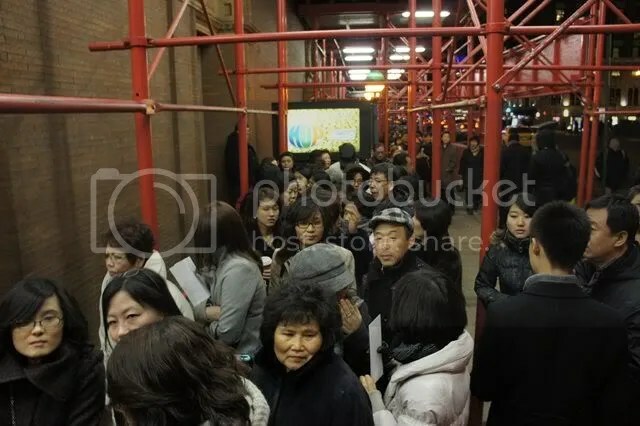 But this year, thanks to SeungGi, I got to welcome the Lunar New Year leisurely in New York City. Since I’d been to most of the tourist spots before, all I did this time was (window) shopping and eating. 😛 [As a side note, the food in Chinatown and Korea Town was simply amazing! A must try!] And of course, there was the concert of a lifetime. When the concert day finally arrived, I could definitely feel the excitement mounting, but I still hadn’t fully recovered from my airport adventure. So I spent the morning relaxing and recuperating in the hotel. A few of the US Airens had originally planned to organize a small event for SeungGi and the staff at the concert. 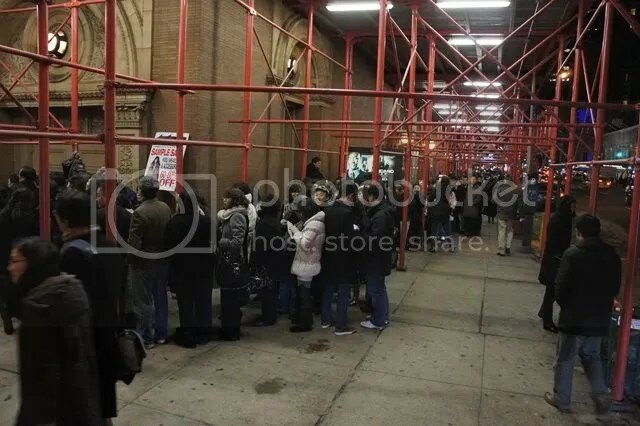 Unfortunately, it turned out that Carnegie Hall did not allow any food/drinks from outside, even for staff members. So the event had to be canceled. 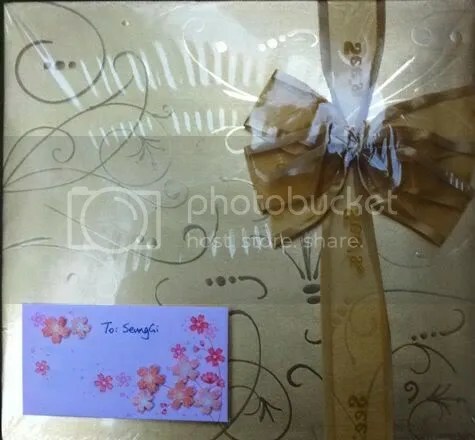 However, we were still hoping to deliver some gifts to SeungGi. I met up with iGo_Seung and a few other fans in the afternoon; they were the ones who’d been organizing everything. We first went to check out the flowers iGo_Seung had helped order for the concert. They were to be delivered to Carnegie Hall by the florist. Next stop was lunch at a Korean restaurant in midtown. The food was nothing to write home about; the highlight for us was finally seeing a concert poster with SeungGi’s picture on it! Anyway, he seemed really nice and we (well, everyone except me, since they were all speaking Korean) started explaining all the gifts to him. 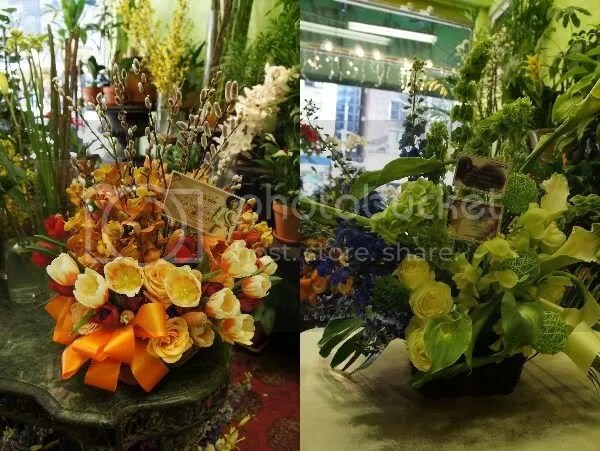 He said the flowers had already been delivered to Teacher and SeungGi’s waiting rooms. Since he’s a big guy and could easily carry all those gifts by himself, we couldn’t really offer our service hoping to tag along to the backstage. 😆 After he disappeared from our sight, we went our separate ways to get ready for the concert. I just went back to the hotel and took a nap. I got to my seat pretty quickly. It was inside a private box, which was pretty nice. But the stage was not as close as we had imagined. Anyway, Lee Seo Jin came on stage first, and did a very brief introduction of Teacher SunHee. I think it was a little too brief, and the audience’s reaction was somewhat subdued. Honestly, I couldn’t believe that he came all the way here from Korea just for that. Then Teacher SunHee appeared and was greeted by a big round of applause [of course :P]. 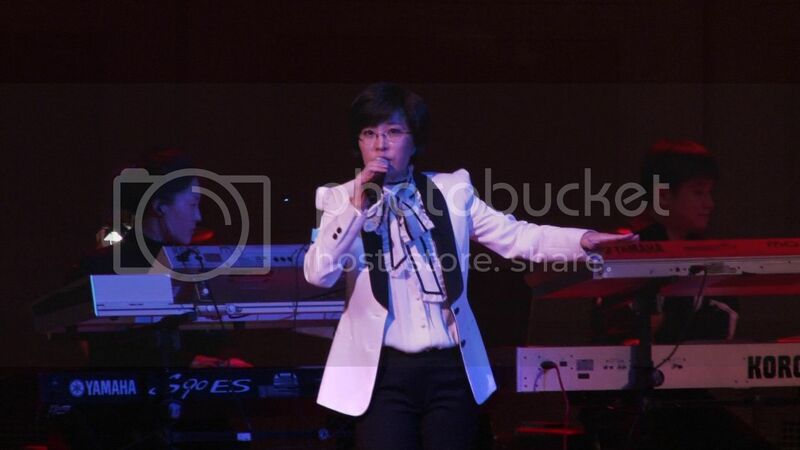 I had seen her perform live at SeungGi’s Hope Concert last year, so I had already learned firsthand what a talented and powerful singer she was. Even though I didn’t know that many songs of hers, I thoroughly enjoyed all her performances. Then, finally! It was SeungGi’s turn! Even though he was a little far from us, we still could see his face clearly, which was a big improvement from Hope Concert. 😛 So I just stared at his face, still amazed at how close-up I saw him just the day before at the airport, even though everything was still a blur. Now, he was right in front of my eyes again, and I could stare at him all I wanted without being intrusive. Haha And I could finally confirm all the other fan accounts about how lean and tall he was, how small his face was, and how heart-melting his smile was. And he just looked so sharp in that black (and somewhat sparkling) suit! SeungGi then proceeded to sing 3 songs. He also talked a lot between the songs. I was so busy taking pictures and videos (at the same time!) while trying to hide from the usher, I missed a lot of what he said. But there was a very cute heodang moment when the fans responded to something he said, but he couldn’t hear the fans clearly. So he looked up to our side, where most of the noise was, 😆 with a quizzing look, and his expression was so adorable! 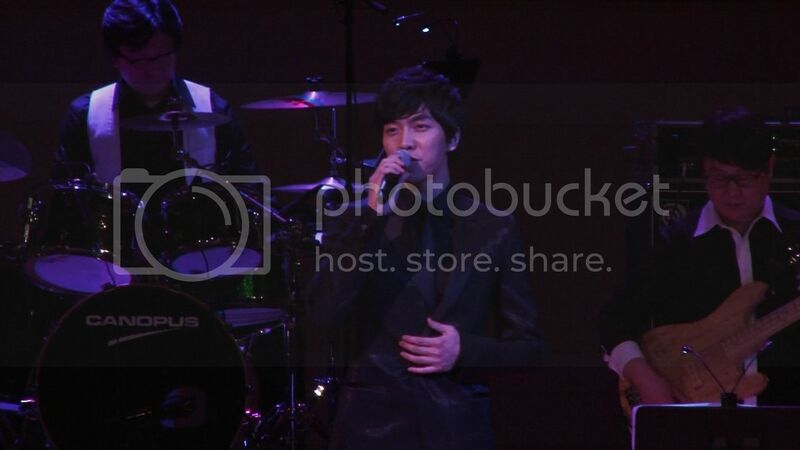 SeungGi’s performance of the 3 songs was definitely too short! 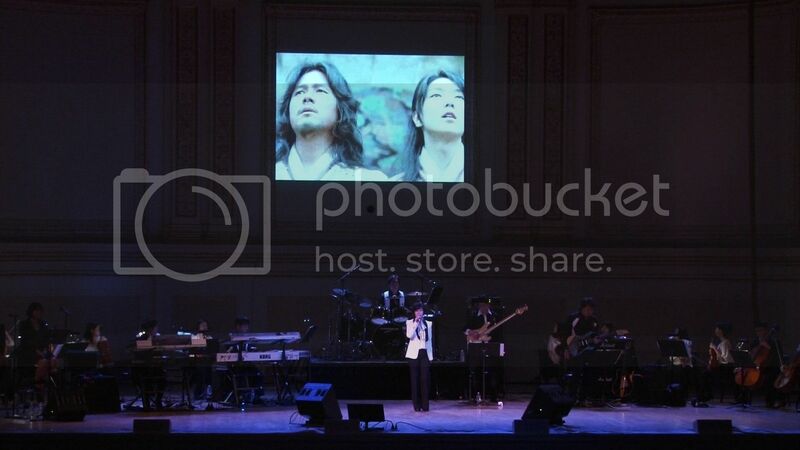 And we were really hoping that Teacher SunHee would come back on stage to do a duet of ‘To J’ with him. But alas, it didn’t happen that way. SeungGi took his bow after the 3rd song and disappeared from the stage. 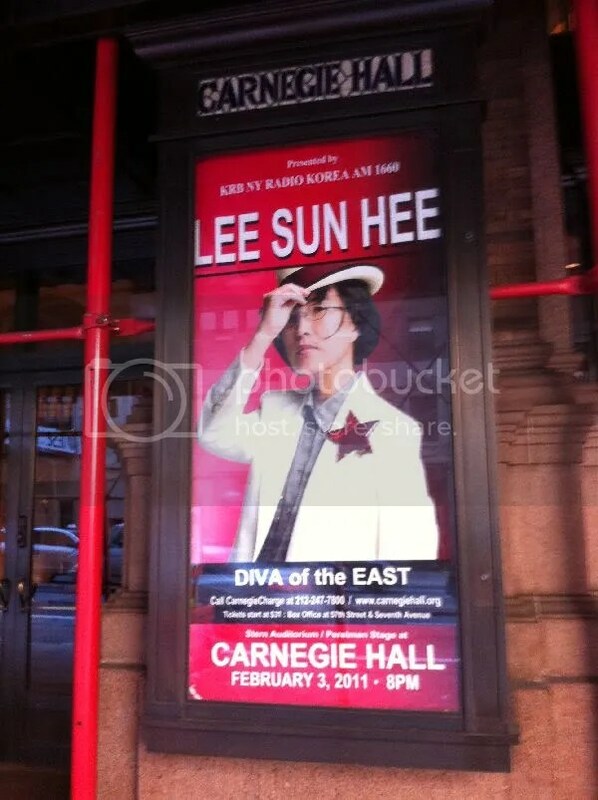 😦 And that was the end of his Carnegie Hall appearance. 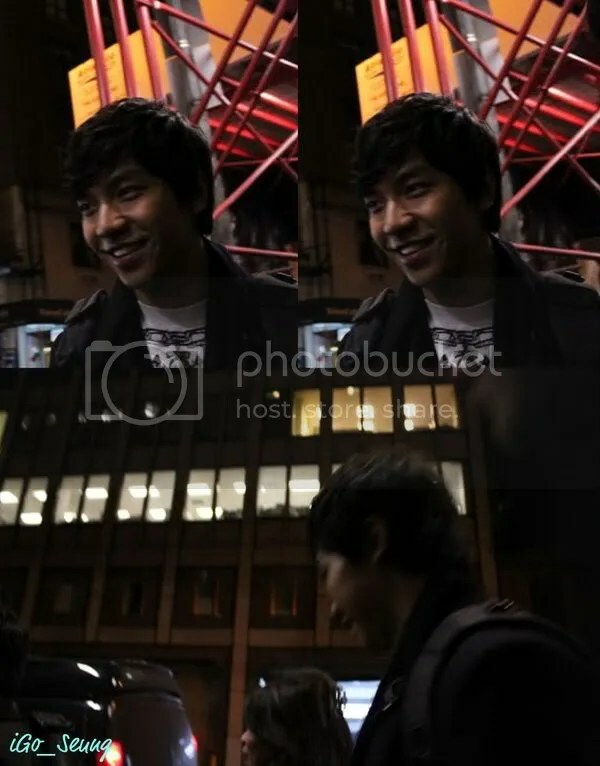 Fortunately, iGo got some really nice shots of SeungGi from the front! The van on standby was actually for Teacher SunHee. SeungGi and Lee Seo Jin got into an SUV (I think it was the same one I saw at the airport). After SeungGi got in, he waved to the fans, and said ‘thank you’. Then the SUV took off. A couple of fans tried to hail a cab to chase after it, but had no luck. We were all super excited about this encounter, but we were super hungry as well. So we headed to Korea Town and chatted nonstop about SeungGi over a super delicious dinner. And that was how my Lunar New Year celebration came to an end. I am here first time as I recently heard Lee Seung Gi on youtube thanks to young guitarist who played Return. I wanted to check original song and thats how it started. I live in UK and Im Polish which make it even funnier but the problem is he is not knows in Europe…. 😦 Therefore I have no hopes of seeing him live ever. But thanks to you blog I got first handed experience of meeting that adorable young artist 🙂 Keep blogging and I will keep reading. And Happy New Year. Hi Cali, LSG was one of torch bearers during the recent London Olympics. It during the “run” in Manchester, I think. I am sure you can find posts of that here in Tryp’s. I am just excited to let you know about that because you live in UK. It was during the torch relay in Manchester & many fans cheered him on as he ran, as seen in touching photos & videos. 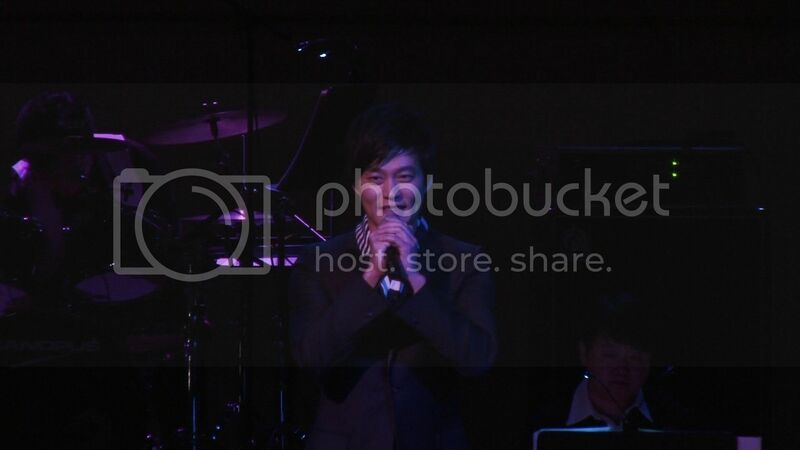 Thank you for this wonderful account of your memorable Lunar New Year (2011) celebration, with Lee SeungGi, in NY.